What is Quantum Physics and Metaphysics and how are they related? Is there a world in which spirituality and science are intertwined with each other? The current consensus is that religion and science do not mix, they have opposing views and cannot synergize. Is magic truly a science we just don’t understand yet? There is a shift occurring on the planet and new quantum technology emerging. There is a deep esoteric, ancient and universal truth at the foundation of these technologies and the rise of the awareness of a quantum realm. Quantum mechanics shows us that physical matter should not exist…. Is this an illusion? Do we exist? There is potential for a collective existential crisis when we reflect on the implications of this discovery, including the potential and opportunities it presents us, our planet and humanity’s journey into outer space. Quantum Physics is the study, observation and experimentation within the quantum realm. The quantum realm represents waves and particles that are subatomic, smaller than an atom. At the turn of the century, in 1900, Max Planck first made the assumption that energy was made of individual units that he called quanta. Later, in 1905, Albert Einstein began theorizing that energy and radiation all existed in a quantum manner. It was not until 1925 until German Physicists Werner Heisenberg, Max Born and Pascual Jordan developed matrix mechanics and henceforth modern Quantum Mechanics was born. This was a revolution in the understanding of the construct and fabric of what makes the universe work and what connects all of creation. Quantum physicists soon began to discover that the quantum world and the laws within this world did not coincide with Newtonian Physics. The commonly accepted universal laws such as Newton's First Law, that states an object will remain at rest or in uniform motion in a straight line unless acted upon by an external force, did not apply in the quantum realm. A reality of waves, particles and bi-location in which a particle exist in two different places at the same time began emerging. In the famous Double Slit Experiment it was discovered that an electron would behave differently depending on whether it was observed by a spectator or not. This experiment proved that intention and observation affects the outcome of our external reality, or at least what we perceive as our reality. Quantum Physics opened up a universe of awareness to begin to explain the unexplained and unseen world. It is a doorway to understanding the science of magic and consciousness. Metaphysics is explained to be branch of philosophy that deals with the beginning or creation, including abstract concepts such as being, knowing, substance, cause, identity, time, and space. However, it is more than that. Metaphysics is an awareness of all that is… before time, space, religion, division and separation… It is the reservoir of awareness that contains the truth of humanity: where we come from, why we are here and who and what are we? Esoteric wisdom and scriptures, ancient text from vanished civilizations, spiritual practices of the East all carry metaphysical information that is designed to inspire and empower us to be the civilization we are designed to be. Metaphysics is metaphorical quantum physics. Metaphysics and Quantum Physics are one in the same. This new science is not new; instead it is another way of describing ancient truths of how the universe was created and the mathematics behind the matrix. 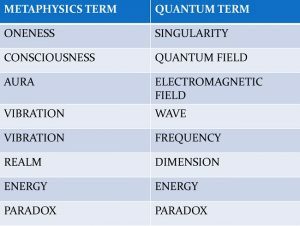 Metaphysics and Quantum Physics share many similar terms that are different ways to say the same thing. See the graph below in which I show some of these terms. Quantum physics is a resurrection of this wisdom that is providing humanity with the ability to create advanced technology, cure all illness, end poverty and literally create heaven on Earth. The quantum technology to create this world already exists. Many of these technologies are suppressed or hidden from us due to monetary and capitalist greed or for the purpose of power and control. More specifically quantum physics and metaphysics deals with the world that we do not see but are the building blocks of our perceived reality. Within this world nothing material or matter exist; it is all energy, vibration and frequency. This is where it can get confusing for some. I see you, I see this table, I see this wall and they are all physical. I can knock on a wall and make a noise and my hand does not go through it. So how can nothing be physical? Once you accept the paradox and understand the vibratory nature of all in existence, some of the pieces start coming together. All matter vibrates and has a corresponding frequency. On Earth we measure frequency in Hertz (Hz). Hertz represents how many times per second something vibrates. For example, if I had a Pythagorean monochord and struck the string; if the string vibrated 100 times per second that would be 100 hertz (Hz). That is our form of measurement of this universal phenomena on our Earth. Everything vibrates and has a frequency; including, the planet, people, food, the sun, your car, your children, your mother in-law, your mother-in-law’s heart… EVERYTHING! Some ancient civilizations seemed to have an immense understanding of the vibratory nature of all matter and could even shift frequencies with tools, instruments and some with advanced technology. Our entire Universe exists at a certain frequency and so does our specific dimension. Vibration is able to be perceived by utilizing each of our senses. In the form of sound, we can hear it, and in the form of visual, we perceive the reflection of a specific frequency (Sacred Geometry is a great example of this). Humans are known to only be able to perceive a certain frequency range and this goes for our sight, hearing, sense of smell and so forth. We know dogs can hear certain whistles that humans cannot due to their range of frequency. This is true with our dimension as well. We exist within a dimensional construct that is a range of frequency. If you were to say we as humans on this Earth at this time exist in 4 dimensions… the 4th being time… then it is understood we exist in the 1st, 2nd, 3rd and 4th dimensions. For sake of understanding let's say that 1st-4th dimension is 100 Hz - 400 Hz. Now, we know that 500 Hz exists and even 1,000 Hz or 10,000 Hz; and we also know we are unable to perceive and see these frequencies due to our physiological abilities. You can call these the other dimensions or realms. Many esoteric and ancient scriptures as well as modern scientific evidence suggest that these realms of frequency allows the individual to connect to a higher level of consciousness, perspective or universal understanding. 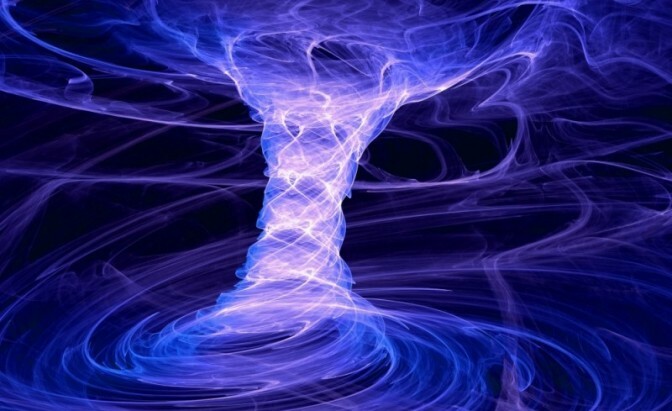 The quantum world is a form of energy and frequency that connects everything and by shifting into another dimension it is possible for us to enter an entirely different realm of experience based on a new set of universal laws. Many ancient civilizations based their entire existence around a deep spiritual connection to the cosmos and the Earth; and they spoke about the same concept of dimensions and frequency. In Ancient Hindu and Vedic tradition this was called Enlightenment. Through meditation, silencing of the mind and practice Gurus and followers would shift their frequency in order to receive messages, wisdom, inspiration, insight to other dimensions of existence. Enlightenment is the ability to bring forward wisdom from these ‘higher realms’ into the physical body that exists in this world. These enlighten being founded religions and movements in which they had countless followers. The ability to shift or raise one's consciousness affects an individual's personality in a way that emanates radiance, confidence and a sense of knowing. It is understandable that those who were not at that level of awareness or consciousness would have been in awe in ancient times wisdom, depth and beauty these individuals emanated. A good, concise article and easily understood. Thank you Neil. Let us enjoy the third dimension though while we still have it as I’m sure we will miss it in many areas of the huge range of emotions that we can experience. Do you expect this raise of frequency to happen by itself?